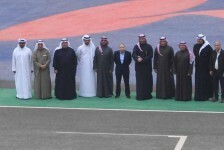 President of the International Automobile Federation (FIA), Mr. Jean Todt, and Vice President Mr. Mohammed Bin Sulayem toured the Kuwait Motor Town. FIA president praised the efforts exerted in this sport edifice. Dr. Emad Bu Khamseen, Chairman of the Board of Directors of the International Club of Kuwait, and the Executive Director Mr. Issa Hamzah participated in the tour.